For many westerners, memories of Boris Yeltsin are filled with images of a fun-loving, unpredictable and occasionally reckless individual who in some ways was the very personification of Russia itself. Boris Yeltsin, the first President of the Russian Federation, was unlike any other leader of modern times. Dancing on stage with girls during a live musical performance on Red Square; causing former US President Bill Clinton to convulse in a fit of uncontrollable laughter at the podium; standing on top of a tank at the height of the Soviet attempt at a coup d’état, exposing himself to the gravest danger. These are just a few of the many indelible memories left behind by the man who almost singlehandedly brought down the sprawling Soviet Union. According to Nikolay Svanidze, "Yeltsin gave Russia stability, the Constitution, democratic government, free market economy and free press. This is enough to recognize Yeltsin as a prominent and definitely positive historical figure, albeit a controversial one." For Russia, Boris Yeltsin was the right man at the right time, and the time was certainly ripe for the epic collapse of an empire – like Rome – that was suffering from imperial overstretch and bankruptcy. Although there are vastly differing opinions about Yeltsin, and the role he played in Russian history, historians are practically unanimous in the belief he helped to initiate the dissolution of the Soviet Union with the minimal amount of violence and loss of human life. This achievement in itself is enough to immortalize Yeltsin in the annals of world history. Indeed, nobody in the West could have predicted that such a massive and powerful regime as the Soviet Union would one day implode with little more than a whimper. 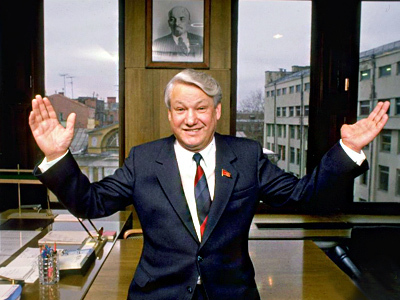 In a series of remarkable events, which seemed to western observers at the time as nothing more than cosmetic reforms as opposed to the epic-changing events they were becoming, Yeltsin quit the Communist Party in 1990; in June 1991 he emerged victorious in Russia’s first direct, popular elections for the presidency. Then, during a dramatic coup attempt to overthrow Gorbachev in August 1991, Yeltsin never lost his nerve. He organized a nearly bloodless resistance of democratic forces in Moscow against the hard-line communist challenge, thus emerging as the country’s most powerful politician. It is one thing, however, to topple a government – indeed, an empire – but a completely different thing to transform an economy. And that was the awesome challenge that faced Yeltsin and the Russian people following the collapse of communism and the embrace of free market capitalism. Suddenly, overnight, Russia was consumed by a privatization spree, with factories, companies and even the nation’s vast natural resources falling under the control of a handful of tycoons. Despite Russia being ravaged by this complex cocktail of economic, political and social ills, Yeltsin managed to beat off a challenge by the leader of the Communist Party Gennady Zyuganov in the 1996 presidential election. Yeltsin managed to attract 53 percent of the vote to Zyuganov’s 40 percent in a runoff election. Yeltsin, however, recovering from two heart attacks, was now entering the most challenging moments of his dual presidency. Not only was Russia’s transformation to a free market economy becoming increasingly chaotic (on August 17, 1998, Russia experienced a severe financial crisis as the ruble collapsed, wiping out the savings of ordinary Russians, while destroying thousands of businesses), but the hot coals of war in Chechnya under Yeltsin (Dec.1994 to Aug. 1996) were starting to rekindle. The last years of Yeltsin’s presidency were spent reshuffling the government as four premiers came and went. 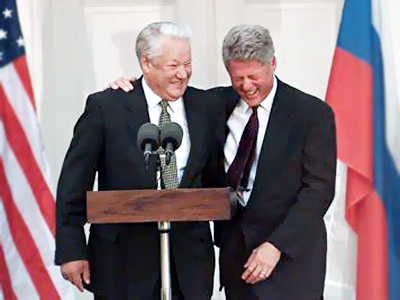 In 1999, the State Duma even attempted to impeach Yeltsin, claiming that he had encouraged the breakup of the Soviet Union in 1991, among other charges. This political setback was followed by a wave of bombings that hit four apartment buildings in Buynaksk, Moscow and Volgodonsk, which left 293 people dead, 651 wounded and the country badly shaken. 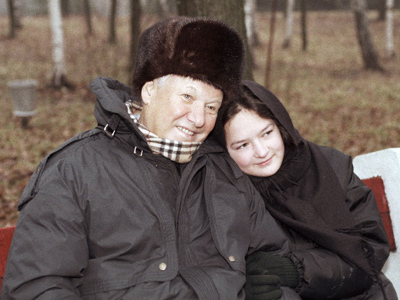 By this time late in his political career, Yeltsin, ever the captain of his own destiny, understood better than anybody that events were moving beyond his ability to control them. In yet another surprise move that caught the world unawares, Russia’s first president announced his resignation on December 31, 1999, ushering the way for Vladimir Putin. In hindsight, Yeltsin’s final act as president of Russia has been a resounding success: Under Putin’s dual presidency, the Kremlin cleaned its corridors of the tycoons who were complicit in the collapse of Russia’s economy; the uncertainty over Chechnya has dramatically decreased albeit it at a high human and material cost; Russia has returned to the center stage as a respected global player – a little over two decades following the near fatal collapse of the Soviet Union. Although part of the reason for Russia’s triumphant return from the edge of the abyss is its wealth of natural resources, this explanation only partially explains the turnaround, while failing to appreciate what could be best described as smart, pragmatic politics on Putin’s watch. That tradition now continues under President Dmitry Medvedev, where Russia continues to develop its economic, social and political infrastructure in pragmatic fashion. The legacy of Boris Yeltsin carries on, and Russia is certainly the better for it.